Colour and Sound - 2002, compiled to identify the historical precedents for a practice in visual music. 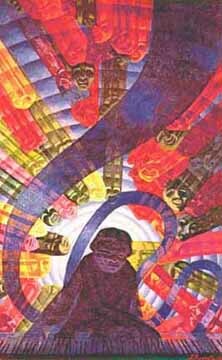 "The early history of this art was driven by an interest in color. In the eighteenth century, a Jesuit priest, Louis- Bertrand Castel, invented the first color organ. Others, including D.D. Jameson, Bainbridge Bishop, and A. Wallace Rimington, created color organs through the next century . The French Jesuit monk Louis Bertrand Castel, the well-known mathematician and physicist, was a firm advocate of there being direct solid relationships between the seven colors and the seven units of the scale, as per Newton's Optics. 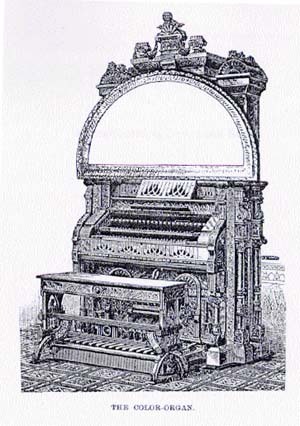 Around 1742, Castel proposed the construction of a clavecin oculaire, a light-organ, as a new musical instrument which would simultaneously produce both sound and the "correct" associated color for each note. "I made a number of experimental instruments, re-modeling and changing them to most fully carry out the idea, and obtain the best effect. The most satisfactory one I made [see frontispiece] had a large ground glass about five feet in diameter, framed like a picture, and set in the upper part of the instrument. On this the colors were shown. The instrument had little windows glazed with different-colored glass, each window with a shutter, and so arranged that by pressing the keys of the organ the shutter was thrown back, letting in a colored light. This light, diffused and reflected on a white screen behind the ground glass and partly on the glass, produced a color that was softly shaded into the neutral tint of the glass. Chords were shown properly, the lower bass spreading over the whole as a ground or foil for the other colors or chords of color, and all furnishing beautiful and harmonious effects in combination with the music." Quote above from "A SOUVENIR OF THE COLOR ORGAN, WITH SOME SUGGESTIONS IN REGARD TO THE SOUL OF THE RAINBOW AND THE HARMONY OF LIGHT WITH MARGINAL NOTES AND ILLUMINATIONS BY THE AUTHOR, BAINBRIDGE BISHOP, NEW RUSSIA, ESSEX COUNTY, N. Y. 1893 Copyright, 1893, by BAINBRIDGE BISHOP. THE DE VINNE PRESS." Fred Callopy of rhythmiclight in his website gives an excellent historical account of colour and music in terms of the literature available on artists/composers/researchers who worked in this area. As well as summarising some of the colour to music scales, he also presents other attributes of image and music focused on, some I have included here from the site. The most persistent association of color and music has been the effort to correlate discrete hues with specific tones. Of all of the possible correspondences between the elements of color (hue, saturation and value) and those of sound (pitch, amplitude, and tone color), the most often proposed mapping is of pitch to hue. Many such mappings have been proposed and some were built into light instruments. Each instrument or voice has its own characteristic tembre. The artist Kandinsky considered how these might relate to colors. Yellow ... an ever louder trumpet blast or a fanfare elevated to a high pitch. Colored Rhythm is in no way an illustration or an interpretation of a musical work. It is an art in itself, even if it is based on the same psychological facts as music. Leopold Survace "Cerebral art-art which has gone beyond the reflex-gesture of a sensation or external perception"
...By 1930, Thomas Wilfred had coined the word lumia to describe the emerging art, and organized the structure of lumia around three factors. "Form, color and motion are the three basic factors in lumia-as in all visual experience-and form and motion are the two most important" . 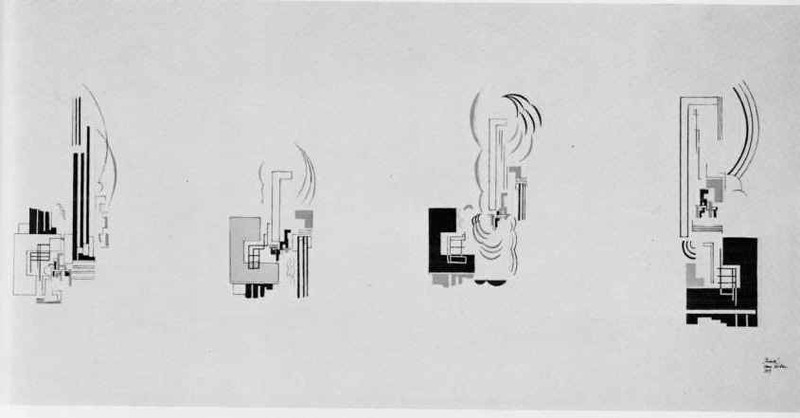 It was with Wilfred's Clavilux that controls came to be organized into three groups. Thomas Wilfred, “Light and the artist,” Journal of Aesthetics and Art Criticism, (V) June 1947, 247-255. Quote "2.4.1 Synthetic or Artificial Synesthesia Synthetic or Artificial Synesthesia is induced by joining the real information of one sense (sight, sound, touch, taste, or smell) and mapping it onto another sense through the use of a cross-modal device. Eg: Seeing with your ears when using a device that maps images into sounds, or hearing with your eyes, by mapping sound to images. " In this illustration, you see a spinning string vibrating in harmony, this description sounds like a musical instrument, but it is a light sculpture. The vibrating form is a superposition of the second and fourth harmonic: a 'visual chord'. Download ZIP ART for free from his site - It is his first experiment at creating a visual instrument with a computer. Fred Callopy of rhythmiclight recommends using the HSV colour model when attempting to map colour to music. Fred Callopy of rhythmiclight recommends using the HSV colour model when attempting to map colour to music. In his website he gives an excellent account of colour and music in terms of history and in terms of designing software that maps colour to music. His imager software is utilised by himself to create colours and forms that respond to music. The language we use to denote colors is associated prirnarily with their hues. rainbow because there were seven natural tones in the musical scale. A hue can be referenced by its angle around a color wheel. 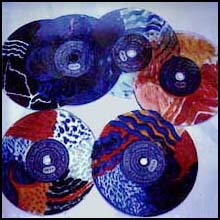 Numerous color wheels have been defined. They all share the objective of making the relationships among hues more accessible. Because hue is a continuous space, naming and distinguishing among hues is somewhat arbitrary. Goethe and Schopenhauer spoke of six distinct hues, Ostwald of eight, Munsell of ten . deep notes. Saturation describes how pure a particular hue is. It is also referred to as the intensity, strength, or chroma of a color. Reducing the saturation of a particular hue, while maintaining its value, has the effect of adding white pigment, producing what artists call tints. Value is the quality that differentiates a light color from a dark one. It is also referred to as lightness. A particular color moves toward black by a reduction in its value. Low-valued colors are less visible than ones with higher values. Decreasing value while leaving saturation alone has the effect of adding black pigment, producing what are referred to as different shades. Finally, what artists refer to as tones can be created by decreasing both saturation and value. One of the reasons that the HSV color model is so useful is that there is a substantial literature that uses these concepts: hue, tint, shade, and tone-to describe art history and technique. Worth checking out for christmas parties!!! 110AC-operated; 4-channel color organ; high-impedance line input; additional sensitivity pot. The Audiovisual Environment Suite (AVES) is a set of five interactive systems which allow people to create and perform abstract animation and synthetic sound in real time. 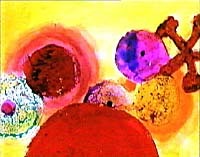 Parallel in the 1920s to people working with color organs, Walther Ruttmann and Oskar Fischinger were pioneering visual music films in Germany, using tinted animation to live musical accompaniment. 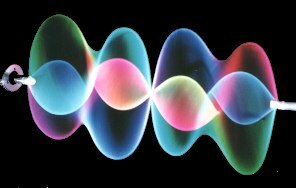 Cinematic experiments creating sound without using external sources began in the 20s with the recognition that patterns read optically can produce sound. "The flood of feeling created through music intensified the feeling and effectiveness of this graphic cinematic expression, and helped to make understandable the absolute film. Under the guidance of music, which was already highly developed there came the speedy discovery of new laws - the application of acoustical laws to optical expression was possible." 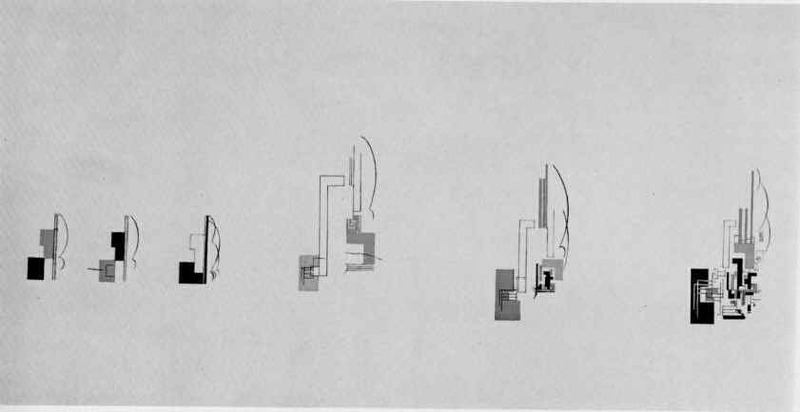 Etudes, Optical Poem (1938) to music of Second Hungarian Rhapsody by F. List, Motion Painting No. 1 " (1947) to music of Third Brandenburg Concerto by I.S. 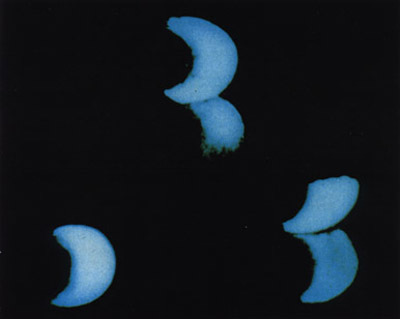 Bach"
Fischinger's Lumigraph was licensed for use in the 1960's sci-fi film, Time Travelers. (1935 - 1980) approx "One of my art teachers put me onto trying to find my own art theory. After many morning walks...an idea hit me that seemed like a complete revelation. It was to compose motion, just as musicians compose sound." "There has never been a great film unless it was created in the spirit of the experimental filmmaker." Len Lye was a major figure in experimental filmmaking as well as a leading kinetic sculptor and an innovative theorist, painter and writer. He pioneered 'direct film,' film made without a camera, by painting and scratching images directly onto celluloid, by reworking found footage, by casting shadows of objects onto unexposed film, and by experimenting with a number of early color techniques. "All of a sudden it hit me - If there was such a thing as composing music, there could be such a thing as composing motion. After all, there are melodic figures, why can't there be figures of motion?" "We realized that the “orchestration” of time was the esthetic basis of this new art form." Richter's position in the art world was unique. As one of the earliest exponents of Dada, he was also one of the first to recognize the new possibilities cinematography offered the artist. He participated in the first avant-garde film movement alongside Léger, Duchamp, Man Ray, Picabia, Cocteau and Dali, and later in New York his teachings would influence many of the "New American Cinema" filmmakers. He worked initially with abstract and object animation sequences interspersed with nonrealistic live-action photography. In 1921 Richter created his first film, Rhythmus 21. He used the rectangle (the shape of the screen) as his basic form and orchestrated with time. "It became possible to relate (in contrast-analogy) the various movements on this 'movie-canvas' to each other" (Richter2, p79). The contrasts were the opposites presented in the film: black against white, left against right, top against bottom. Portraying similarities while displaying these contrasts would result in analogies. Richter and Swedish painter Viking Eggeling experimented with several artistic techniques and different media for expression. such as the Chinese language. "They did not study the language to learn Chinese, but to understand the relationships between the lines and curves of the symbols. Eggeling's focus was more on the lines themselves, whereas Richter was concerned with the interplay between the lines. This is when Richter begins to bring together his ideas positive-negative relationships and reshape them into rhythmic expression. "...a vertical line was accentuated by a horizontal, a strong line connected with a weak one, a single line gained importance from many lines etc." Two Additions to the Tradition Two younger filmmakers have also devoted themselves to making abstract films directly on the filmstrip: Richard Reeves in Canada and Bärbel Neubauer in Austria and Germany. Len Lye and Norman McLaren made such an impression with their abstract films painted and scratched directly onto film that when some other cameraless film begins to screen at a festival one often hears several disgruntled voices saying, "McLaren and Lye already did this"--as if nothing new could be done with the technique. Drawing or scratching directly onto film strips is just a technical means, and nobody would think of saying, "Painting on cels? That's already been done, so I won't watch this new film..." Several people like, the Italian brothers Arnaldo Ginna and Bruno Corra, the German Hans Stoltenberg and the Belgian Henri Storck, painted abstractions on film before Lye and McLaren, but these films do not survive for us to see or judge. Films like Lye's Colour Box and Free Radicals or McLaren and Evelyn Lambart's Begone Dull Care are superb masterpieces that one can see over and over, and remember fondly. Plus, the tradition of direct abstract film continues: the great Basque painter Jose Antonio Sistiaga made a feature-length direct abstract film, Ere Erera Baleibu Icik Subua Aruaren, released in 1970, while Lye and McLaren were still alive. Believe it or not, all 75 minutes of it are fascinating, with a cumulative satisfaction. Sistiaga's 1989 7-minute Impressions In The High Atmosphere is a breathtaking masterpiece. A central circle, stable except for its fluctuating enamel-like textures, is surrounded by restless, swirling currents. His 1991 14-minute Nocturne is again a deeply moving, and very beautiful, film. "Shortly after the end of the nineteenth century, a strong avante garde movement was moving throughout the world of art. Expressionism, constructivism, surrealism, cubism, and dadaism were all parts of this newly structured abstract art. Traditional theories of representational art were thrown out the window. New ways of working with space, shape, form and even time began to make their way into the artistic scene. Near the forefront of this movement was a painter by the name of Hans Richter." Twentieth-century painters and photographers in Germany and France, confronted with the increasing dynamism of everyday life, investigated the technical and aesthetic fundamentals of film. They hoped with this new medium to achieve 'a dance-like motion of the entire image' (W. Ruttmann). With new single frame exposure and montage techniques of single frames, the filmmakers of 'absolute' and surrealistic film succeeded in setting in motion even static images and stationary objects. Because of the numerous European experimental filmmakers who fled National Socialism, the avant-garde cinema of the Twenties reached the U.S.A during World War II. Young filmmakers eagerly adopted the avant-garde and further developed it in their own sound and colour films. Still today, artists with varying aspirations are interested in dancing images because it enables them to compose visual music, exhaust the borders of perception or extend dance to new dimensions. 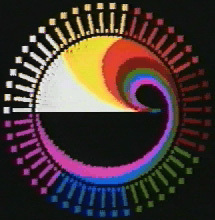 While theories for the visual equivalent of music have existed since antiquity, the mechanics necessary for the expression of the art of color and movement developed only recently into the current wide range of media and techniques. Yet along with this modern variety of methodology, there somehow came a polarization of the art form based on its varying technology. In the world of film it has been known as many things, including "Abstract Animation" or "Absolute Film." In video it has been referred to as "Video Synthesis" or "Image Processing." And centuries before either medium, artists invented their own one-of-a-kind hardware to project moving imagery in live performance. Some of the later "visual music" inventors gave the art their own name, such as "Lumia," "Mobil Color," or "Color Music." "Inventions of light forms and movements" is the way Man Ray described the films he made in the 1920s. True to Dadaist tradition, Man Ray questioned the application of prevailing logic in the sequence of images in his films. The represented should only stand for itself. Images should not be bound together by means of a general content, but only through montage. In this way, in "Emak Bakia”, light and its reflections along with the movement of bodies and objects become pure visual poetry. The creator of the early abstract films Opus I, II, III and IV, began this, probably his best know film, in 1926. Ruttmann directed the film and collaborated with Carl Mayer (a screen writer who had co-written the script for Das Cabinet des Dr. Caligari), Karl Freund (the director of Fox-Europe Production), and Lore Leudesdorff who had already assisted Ruttmann with Opus III andIV. Rather than write a conventional script Ruttmann devised a card system that allowed for flexibility and reshuffling of ideas for scenes and the overall structure of the film. In addition to written notes for an idea, a card included specifications about the length of the scene, the desired atmosphere, and a visual sketch, a mini-storyboard so to speak. The music that accompanies the film was written by Edmund Meisel who also directed the orchestra at the film’s public opening at the Tauentzien-Palast in Berlin. Ruttmann and Meisel worked closely together aiming at a harmonious whole consisting of images and music, and Meisel described the music as a “conglomerate of the various sounds of a metropolis”. 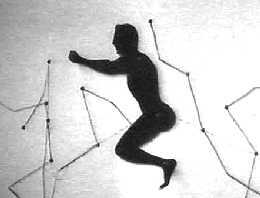 Since creating his purely abstract Opus films Ruttmann had made a number of advertisement films for Julius Pinschewer, had worked on Paul Wegener’s film Lebende Buddhas, had created the dream sequence for Fritz Lang’s Die Nibelungen, and had made the beginning sequence, some of the background imagery, and other scenes for Lotte Reininger’s silhouette film Die Abenteuer des Prinzen Achmed. His advertisement films combined abstract with representational imagery and color with black and white sequences, and his contributions to the feature films meant, of course, that his largely abstract images were subsumed within a larger, representational whole. These were precisely the two uses of purely abstract filmic images that the critics of the absolute film approved of. By the time he began Berlin, Symphony of a Great City, Ruttmann had come to the conclusion that he needed representational imagery to accomplish his vision in film. 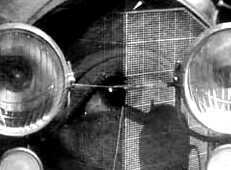 In 1921 the first of Walter Ruttmann´s series of Opus-films were completed. Ruttmann was one of the artists of the German avant-garde who broke new ground with his experiments, and influenced new artists to explore the potential of cinema. The use of the computer in experimental film making has a rich history which reached a peak in the late 1960s, but stemmed from the early approaches and experimental 16mm work by key figures John and James Whitney in the late 1940s. The Whitney brothers were exploring 16mm experimental film, gaining a reputation for their Film Exercises made between 1941-44. The Whitney's had a formidable background in traditional film making techniques winning first prize at the first Experimental Film Festival in Belgium in 1949. John Whitney (1917-1995) later became director of animated films at UPA producing, in association with Saul Bass, the stylized and hypnotic opening title sequence for Hitchcock's Vertigo. 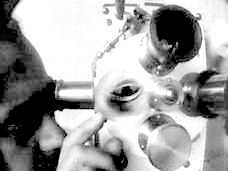 By the early 1960s, with his own company Motion Graphics Inc., he was exploring his passion for the realisation of experimental films using hand built technologies. 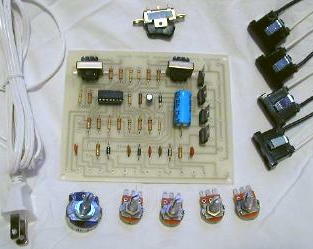 John designed and built an "analogue computer" - a machine to realise effects and ideas that had up to that point no technical means of expression. At the time they said they were "trying to make something and there wasn't a machine available for making it". It allowed infinitely complex rotational camera movement, filters and multiple variations for shutter operations, including slit-scanning; the technique Douglas Trumbull later developed and refined for Stanley Kubrick's experimental sequences in 2001, but which had actually been used by the Whitney family a number of years earlier. The 80's would see an expansion of Whitney's exploration of digital harmony. By now he was composing his own music, searching for, as he writes, "a special relationship between musical and visual design." (Whitney, 1991). Whitney was defining a new kind of composer: One with the ability to conceive ideas both musically and visually. "Whether quick or slow, action, as well as harmony, determines much of the shape of my own audio-visual work today. Action itself has an impact on emotions. Fluid, orderly action generates or resolves tensions much in the manner that orderly sequences of resonant tonal harmony have an impact on emotion and feeling..." (Whitney, 1991). Music is the supreme example of movement become pattern. Music is time given sublime shape. If for no other reason than its universality and its status in the collective mind, music invites imitation. A visual art should give the same superior shape to the temporal order that we expect of music. McLaren was born in Scotland in 1914 and while studying art he had become increasingly interested in the potential of filmmaking. McLaren´s films shows a multitude of different styles and techniques from minimalistic abstract work to short narrative films like the pixillated Oscar winner Neighbours (1952) and the beautiful interpretation of dance in Pas de Deux (1959). McLaren´s investigations of the cinema includes the production of synthetic sound as in the mentioned Neighbours and Two Bagatelles (1952). The investigation of visual realities is crucial for the Danish filmmaker Lejf Marcussen (b. 1936). In the early 70s he joined the Danish broadcasting company Danmarks Radio where he began making experimental films. While his films reveals a mixture of different techniques the notion of film as non-verbal artform is strong in all of them. In Tonespor (1983) he makes a visual interpretation based on music by Carl Nielsen. Each instrumental group or musical "voice" is represented by a coloured line which closely follow the musical movement. My films are more or less educational - I've never done much with them as far as illucidating what the subject matter is - but they are like the basic rhythms that are in music. Mary Ellen Bute Background in Painting. She wanted to "wield light in a flowing time-continuum". Studied stage and lighting in order to build a color organ. Her visuals were made to music and that music was seen in terms of their mathematical formulae. She was influenced by musician Joseph Schillinger. He had developed a theory about musical structure, which reduced all music to a series of mathematical formulae. They had collaborated on a film together that was never made.. However his mathematical approach to music influenced all her animation films. A. Wallace Rimington We have, therefore, in colour, as in music, both discord and harmony, wide in their scope and mutually dependent. We can in both produce series and sequences of harmonies differing in their degree of pleasantness. We can change them into discords and resolve them again into harmonies, we can, in fact, use colour as we use musical sounds. Light-Music Definition of some experimental cinema as being "visual music". Where there is a dynamic action and expressiveness of cinema images, an important role of rhythm, plasticity and light. This visual music reflects its closeness to music and dance. 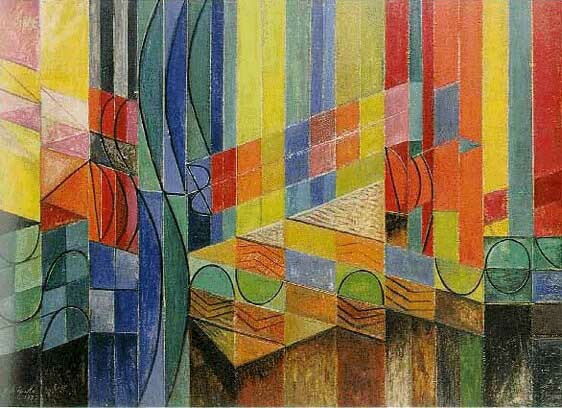 N. Voinov 1931 Abstract film to Rachmaninov's "Prelude in Csharp minor"
His films were closer to painting and light-music and he developed a manual technique of scratching coloured images by hand onto the surface of the film strip. "The dream of creating a visual music comparable to auditory music found its fulfillment in animated abstract films by artists such as Oskar Fischinger, Len Lye and Norman McLaren; but long before them, many people built instruments, usually called "color organs," that would display modulated colored light in some kind of fluid fashion comparable to music....."
Mary Hallock Greenewalt with her Visual-Music Phonograph (1919.) Photo by Shewell Ellis. 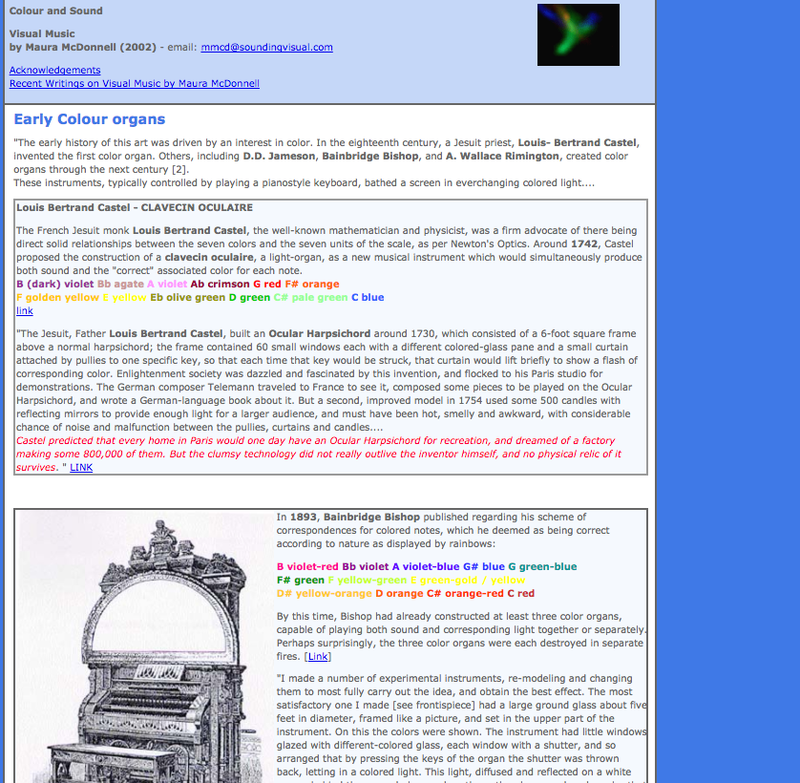 This site was compiled in 2002 by Maura McDonnell in order to gather together some resources and links on the history of colour and sound and visual music. If you wish to make any suggestions or comments, please do contact me. Email: I will be updating the design of this page in the near future. The site consists mainly of quotes from articles, and historical documents that were available online in 2002. The path through the topic is the authors own path. Thanks to C. Keefer at the Center for Visual Music for checking over the page. The Center for Visual Music has extensive resources in relation to this topic. Thanks also to Fred Callopy of Rhythmic Light for his extensive online resources, in particular historical documents that he has made available online.